Retargeting is a mystical world of unicorns and fairies…clothed in a shroud of banner ads. If not used properly, you can blow through thousands of dollars in no time and have no new customers to show for it. So, since everyone likes unicorns and fairies, I figured it might be interesting to take a look at how we’ve been using retargeting for Baremetrics with pretty great success, acquiring new paying customers for as little as about $5-6. What is this mystical banner-ad-shrouded retargeted unicorn you speak of? If you’re not familiar with it, retargeting is a type of online advertising that resurfaces your brand/product around the web after a user has visited your site. The idea here is that once you’ve expressed some level of interest in Baremetrics (as indicated by the fact that you visited the site), then you’re much more likely to become a paying customer than Joe Schmoe who has never even heard of us, which is the way typical banner ads work. Sounds fantastic from a marketing perspective. Of course everyone everywhere should do it, right? Well, no. In fact, there’s a decent chance you shouldn’t drop everything and start doing it today. Let’s talk first about who ad retargeting probably won’t work so well for. As you almost certainly are familiar with, most people don’t really notice or pay much attention to ads. To make people take notice and, more importantly, take action you need to make it clear it’s worth their while. Specifically, you need a strong value proposition. If the value you’re bringing to the table isn’t immediately obvious, you’ll need to do a lot more work and you’re at risk of blowing a large amount of cash if you’re not careful. Don’t blow cash. You’ll be sorry. And sad. And hungry. And potentially homeless if you seriously overspend. No pressure, though. If you’re just throwing money at some simple retargeting campaigns with banners showing your logo…please stop them now. Seriously. Stop it. My buddy Brennan Dunn has written at length about using retargeting effectively by selling value and not the product itself. I 100% agree with him on that notion, and you’d do yourself a large favor to go read that article. However, Baremetrics does happen to have an “immediately obvious” value proposition (not fair, I know), so let’s take a look at how that has worked well for us. How has retargeting worked for Baremetrics? For other startups I’ve run, retargeting never worked well. Those products had more complex value propositions in crowded markets and so everything I tried hit a brick wall. I spent thousands of dollars with nearly no conversions and I had all but written off ad retargeting completely. Then I decided to give it a go for Baremetrics just to see what would happen. And it worked. Hot dog, it worked. The main relevant number there is the aCPA, which is ultimately the cost per acquisition…how much I’m spending to acquire a new customer. The average over the past 2 months has been about $13 across the 2 campaigns I’ve run. Typical banner ads have run around $21 per acquisition and Facebook ads have been about $6 a pop. Considering the LTV of the average Baremetrics customer is around $650…I’m practically printing money here. $6 to acquire a $650 customer is phenomenal. But why has this worked so well? Glad you asked. The exact reasons why one method works for one company but doesn’t work for another could be debated right in to the ground, but I do have a hunch. Baremetrics is immediately recognized as a much needed solution to a big problem. 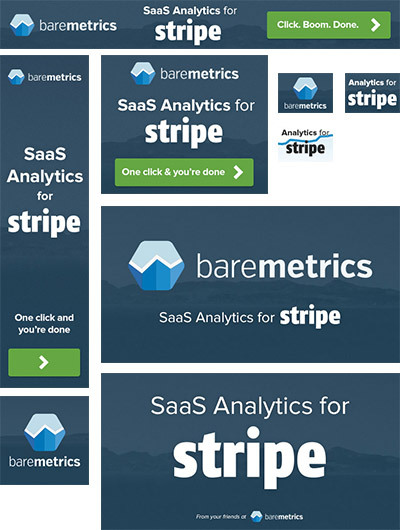 Stripe offers very little on the metrics side, so pretty much any SaaS Stripe user has a need for Baremetrics. On top of that, they’ve likely thought about the lack of metrics or, even better for me, they’ve tried to do it themselves and failed. They are keenly aware that the problem Baremetrics is solving is a major pain point. They’ve felt the pain and the solution to that pain is immediately obvious. So the typical scenario here is someone finds their way to the Baremetrics site, reads about the product, loves the idea, but gets distracted or isn’t convinced the premium price is worth it. Then, over the next few days, they start seeing Baremetrics ads everywhere. Seriously. They can’t get away from them. They are constantly reminding of that pain they’re experiencing every day and the solution to that pain is a click away. Because our value proposition is so simple and so obvious, it takes relatively little work to get them to convert. They just need to be reminding of their pain. No need to onboard them into a drip email campaign or give them any free resources…their pain is blatant and Baremetrics is a no-hassle fix. Then, the main reason for not signing up initially (price) because less of an object because that “pain” has been nagging them more. For reference, here is a smattering of the various banner ads we’ve have or have had running. To start getting your feet wet in the world of retargeting, I suggest running some test campaigns. Perfect Audience is my tool of choice. But you need to be very intentional with your testing. Run two campaigns side-by-side with one being focused on your brand and the simple value proposition your product offers and the second being one that drives people to something tangentially related to your product, such as an email course that’s geared towards a specific problem they have. Again, that article from Brennan Dunn is fantastic walkthrough of setting that up. I’m more than happy to offer some additional insight for you or give feedback on your specific situation, just fire away in the comments. Have you tried retargeting? How have your results been?